Zhangjiakou City announces 50 GW of renewable energy by 2030. 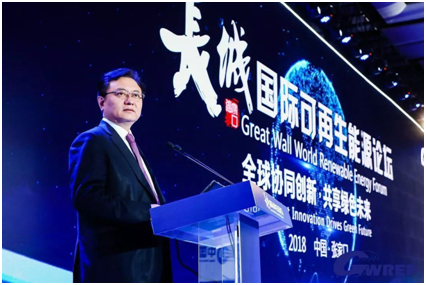 On March 22, 2018, Zhangjiakou City (Hebei Province) hosted the first GREAT WALL WORLD RENEWABLE ENERGY FORUM. A capacity of 50GW of renewable energy by 2030 has been officially announced. For illustration, this is equivalent to any of the following: 2.5 times the total wind and solar capacity installed in the province by the end of 2017, 17% of the total wind and solar capacity installed in China by the end of 2017, 1.5 times the renewable power capacity in Italy in 2016 or 1.2 times that of U.K. in 2017. Zhangjiakou internal energy consumption is however limited. In order to allow transportation and distribution of such an amount of renewable power towards Beijing and other load centers, a GigaWatt scale “Olympic photovoltaic corridor” T&D project is being built. The Ministry of Finance adjusts standards for cost of marine area usage. On March 13, 2018, the State Oceanic Administration of the Ministry of Finance has published the "Notice on Adjusting the Levy Standards for Use of Sea Areas and Non-Resident Islands". In the near future, public administrations are expected to introduce and implement new taxes and standards for "land" utilization and energy generation in marine areas. 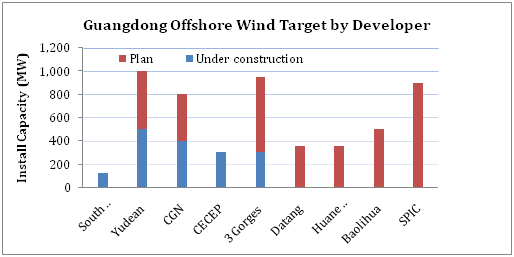 Three Gorges New Energy and Tianjin Binhai New Area Sign a 1 GW offshore wind power project. On March 27th, Three Gorges Energy and Tianjin Binhai New Area signed an "Investment Cooperation Agreement" under which Three Gorges New Energy will invest approximately RMB 18 billion in the Nangang Industrial Zone of Binhai New Area, Tianjin, and build a total of 1 GW of offshore wind power projects. The estimated annual power generation is 2.4 TWh, generating 2 billion RMB of annual income. Marking the first significant announcement for offshore wind in Tianjin, this Three Gorges offshore project is likely to become the closest offshore wind farm to Beijing, as Tianjin serves as a harbor city for the capital. Through offshore wind power projects, Nangang Industrial Zone, will be able to promote local high-end manufacturing industries and local economic growth, likely offering new opportunities for wind industrial players.